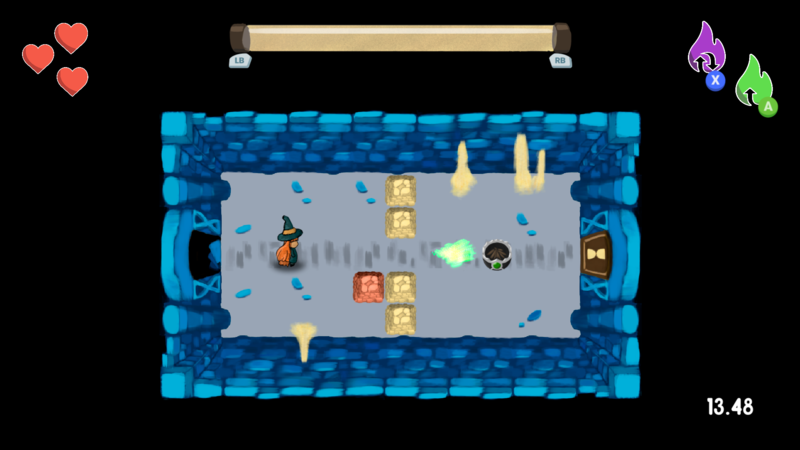 Combine your spells and the power to manipulate time in order to solve the puzzles that lie at the heart of the towers! Towerglass is the first game we made in Aftermind, developed as a university project in around 3 and a half months. 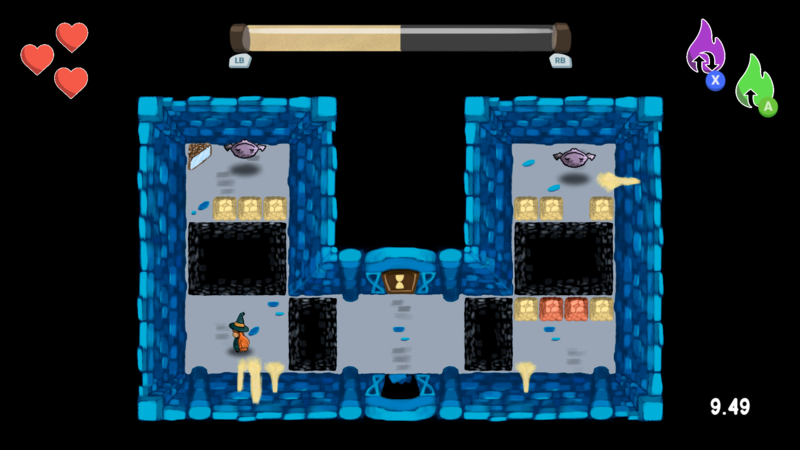 The tools used were Unity, Tiled Map Editor and Photoshop. Make sure you have both game data folder and executable in the same directory in order to run the game correctly. Thank you for the English version, got to play today and... it's been fun. :) Bring on the next towers! Hey, thank you very much for playing Towerglass and for the comments! We're really glad that you enjoyed it! Despite being a project of slow development, we are concerned about creating a cool game experience from the early stages. We have taken into account the great feedback from the recent gameplays of the people and we have made a small update to fix those discomforts when playing it. We hope it is less stressful to solve puzzles in this way! Hahahaha :) We will publish the gameplay on our social networks soon. Thanks again, mate! Looking forward to the full release! Are you guys planning to release a demo with a boss fight, or are you saving that for the full game? Any chance for an English translation? Legend has it that humans long ago coexisted with certain beings called tempomanos. It is said that, although similar in appearance to humans, they had the ability to alter the time of certain objects on a small scale, and to reverse cause and effect on a whim. During the fifth eon, thousands of years ago, humans and tempomanos coexisted in harmony and peace. One day, an evil wizard abruptly altered the causality of the natural temporal line and plunged its inhabitants into chaos, and the anomaly of a universe of diffuse cause and effect. This phenomenon was called "The Gap". Countless tempomanos and human troops were were sacrificed in an attempt to overthrow the wizard; but, immersed in the impotence of the situation, society ended up divided, and the tempomanos, faced with the constant accusations, retreated into exile and clandestinity. One day, a great human scientist managed to find the formula to defeat the vile tempomano, and fragment his power by encapsulating it in seven orbs. These temporal orbs were sent to an impregnable place, guarded by powerful monsters in each one of the seven towers of the mountain range. Since then, time flows dancing and clear, and humans live with this arrangement, going as far as including time as the fourth of its dimensions. And that is the legend of how the temporal line was reconstructed, and time as we know it was created. Good, good, look what we have here! At last, you've arrived! I thought this moment would never come. Perfect, let's start. I hope you remember how to use your magic. 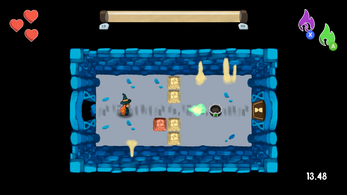 It will help you activate cauldrons and defeat enemies. Go through that door to start, dear. I see you're skilled. You learn fast! However, not everything in this tower is harmless. Behind this door, there are dangers waiting for you to fight. Use your powers, and don't rest on your laurels! But be careful, USING THE DASH WILL SPEND TEMPORAL ENERGY! Good luck, little girl. I'll see you soon. Aremi, you have great power inside you... Now is when the real adventure begins.... Time is a more malleable matter than you think. You just have to trust yourself. But, be careful. Your energy is limited, so use it with caution. And now listen to me carefully. KEEP TRACK OF HOW MUCH TEMPORAL ENERGY YOU HAVE LEFT! WHEN YOU USE IT, YOU WILL GO BACK IN TIME, AND YOU WON'T BE ABLE TO USE SPELLS WHILE DOING IT. IF YOU SPEND YOUR ENERGY, YOU'LL HAVE TO RECHARGE IT. Certain elements of the tower react to this power. Sometimes, you won't be able to advance if you don't use it correctly. Try casting a spell and go back in time! We'll see each other again! Little else I have left to teach you, little one (for now). The towers are immense, and each room contains a puzzle, a riddle, an enigma. But this has only just begun! We'll see each other sooner than you think (hehe)! Keep training, because the temporal orbs do not wait. It has been a pleasure to share these moments together! 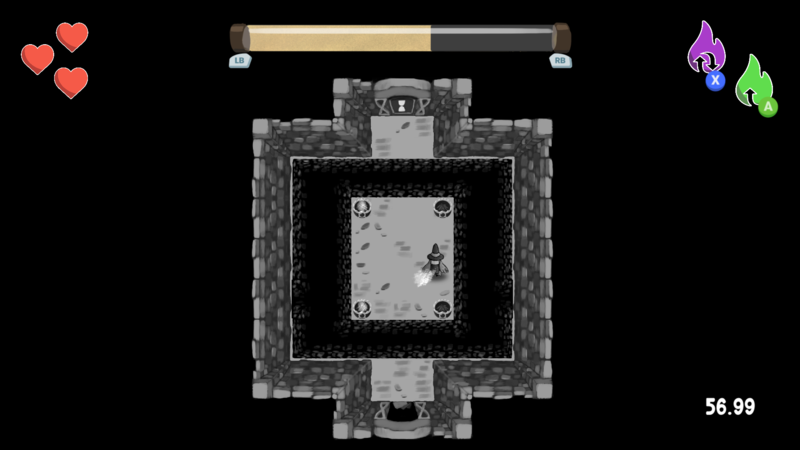 Thanks for playing the Towerglass demo! We hope you enjoyed it! :) You can follow us at: @aftermindteam (twitter) Aftermind team (YouTube). I wish they'd included an explanation of the purple flame. That took me a while to understand. No problem! I did a video playthrough that I'll post tomorrow where I stumble through with my high school Spanish, but have a full translation onscreen. The game's designed well enough that I didn't really need the translation to make it through, anyway. Hello! Thanks for your comment, C.H.! Soon, we will upload a new build with the English translation of the game. Let us know what you think of it if you test it! Hi again CH! We have just uploaded a build with the English translation, let us know that you think of it!